Weren’t we just talking about New Year’s resolutions here? With most of 2018 in the rearview and 2019 quickly approaching, we’ve got less than two months to make this one of retail’s best years ever - and it seems entirely plausible this will be the case - as experts estimate that US retail spending may reach a record-breaking $1.1 trillion dollars this holiday season. It needs no reminder, as we all know that some of the most important days of the retail calendar will be happening in a few short weeks’ time. So how do you make the most of a holiday season that’s longer than most (32 days to be precise), and one where the average person (in the US at least) has a fatter wallet and more confidence than in previous years? In the midst of all your holiday preparations these considerations are critically important, as 2019 will be bringing new challenges and uncertainties - from Brexit to China tariffs - that pose a distinct likelihood of hampering next year’s growth. So on that happy note, today we’ve got a short list of reminders for you to ensure you give shoppers their best holiday yet. Promotional fatigue is a real thing, and right now retailers are averaging 7 emails per week to shoppers. With 32 days to market the hell out of your merchandise, not to mention these few weeks before the official start of the holiday season, there’s a real chance that some retailers are going to take it a little too far. So let’s stop for a moment to figure out - how high are your discounts right now? It turns out that for our sample size of key US retailers, average discounts across all merchandise have been holding steady at around 17%. (If you whittle that sample down to only products on discount - that goes up to an average of 40%.) Nonetheless, if we dial back to last year at the same time, average discounts across all merchandise were one percentage point lower, at 16%. 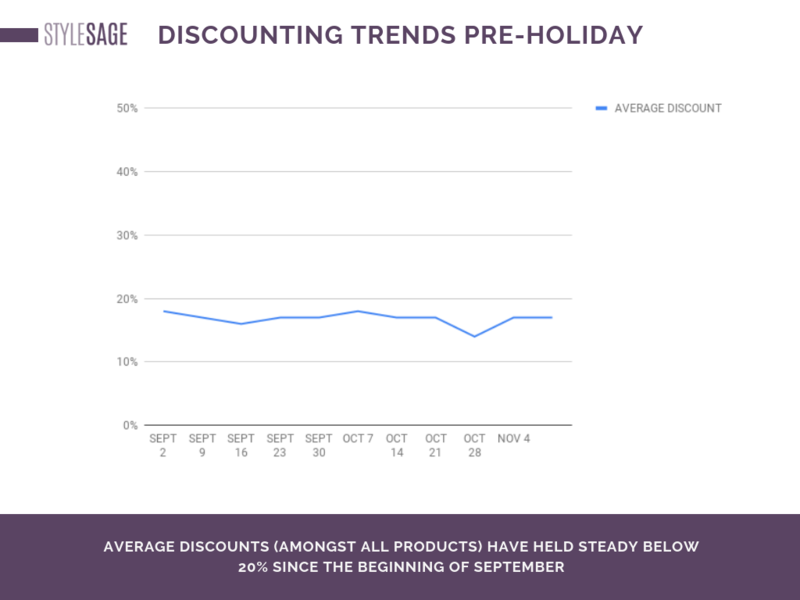 While we certainly expect (and our historic data confirms it), that discounts will rise through the end of November and early December, retailers should be taking in the larger macroeconomic signals (i.e. strong consumer confidence) and using them to their advantage to resist unnecessary and preemptive discounting. With few exceptions, most of your product will get discounted by one means or another during the holiday season - whether that’s a straight discount, a dollar amount off, or even a credit towards future purchases. But when it comes to promotions and discounting, each category should be treated differently. What do we mean? Let’s take a look at discounting trends (for that same sample set we used above) and see where discounting trends differ. 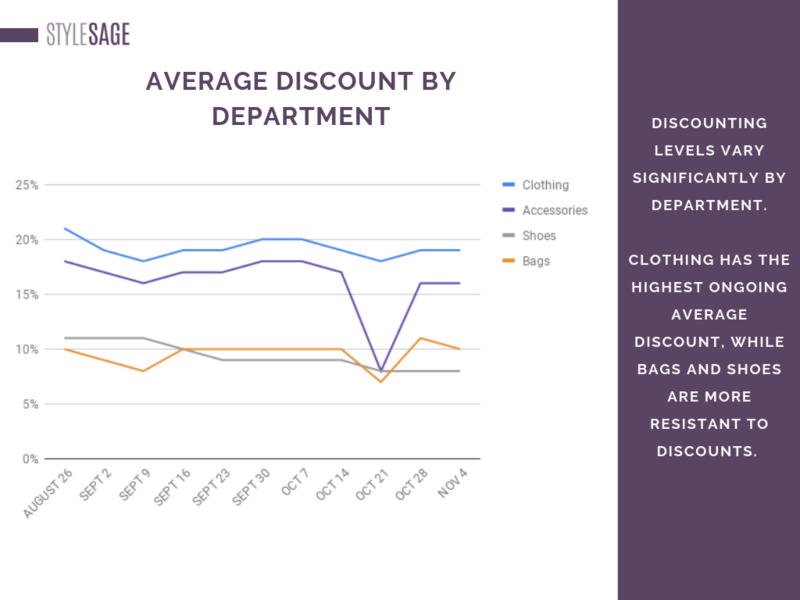 As you see here - clothing maintains the highest average discounts (averaging approximately 20%), while bags and shoes are more resistant to discounting (averaging 10% discount). But within clothing it’s worth a closer look at what’s NOT getting discounted as much, and that includes intimates (11%), sweaters (16%), and outerwear (16%). The weather will prove to be a major factor in the latter two categories, but we’d say be careful not to dial up your discounting too rapidly in categories that are holding their own. With predictions that traffic from social sites to online retail is going to increase significantly (17% from last year), Instagram is a crucial channel to reach shoppers. The direct path that Instagram enables between a specific product photo to your e-commerce site is rife with opportunities. And those shoppers come to Instagram with a number of different need states - to see what’s new, to look for gifting ideas, and to find something for themselves. So will your brand’s scheduled posts take into account these different browsing occasions and the opportunity you have to convert a shopper who wants to be inspired? While 40% of shopping for holiday is anticipated to take place during Cyber Week, there remains 60% that will happen after that. So remind, inspire, and consider who that purchaser is. On the technical side, make sure your product links are intact, and be sure to provide alternative product suggestions should a product become out-of-stock. Shoppers don’t know, nor do they care, if that person working in your physical store is seasonal help, but they will care if they are the recipient of crappy customer service. Which is why the staff you’ve hired and trained for holidays need to meet the standards and knowledge levels of your year-round, full time staff. (Hope you hired your shopper-fans!) So while their domain may be the physical store, they also need to be informed and armed with the tools to answer questions about online. How equipped are they to answer the question of, “I saw this online. Is this available here?” And can they provide alternative ways for that shopper to get their hands on merchandise if it isn’t available in-store? We’ve said it before but it bears repeating: your in-store staff are ground zero and your best opportunity to convert and make positive and lasting brand impressions, but they’re also where things can go terribly awry when uninformed, unengaged, and overworked. And one more note about customer service, are your phone customer service agents and bots ready to be inundated with questions, comments, and concerns? Make sure that script is updated to reflect holiday questions around availability, shipping, and returns, and please, for the love of Saint Nick, don’t make me wait an hour on hold. We know you’ve been gearing up for holiday for many months, but these last-minute reminders will make certain you ring the season in to the sound of ca-ching.